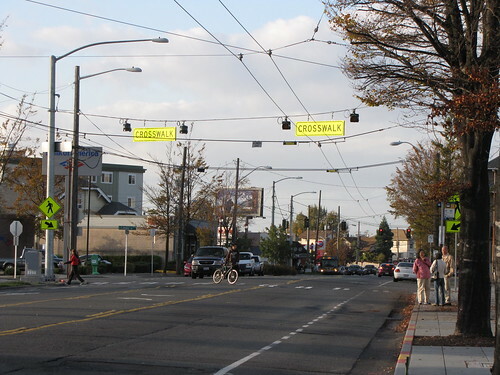 We have received a few questions over the last couple of months about the new crosswalk beacons on Beacon Avenue South at South Lander, just in front of Beacon Hill Station. The crosswalk signs and lights were installed in October, but the lights did not function, and no buttons were installed to activate them. Any word about the lumpy pavement there across the middle of Beacon Ave there at this crosswalk? I’m afraid somebody’s going to lose control there and hurt someone — most likely a pedestrian. I’m putting together a toolkit of safe crossing treatments. Do you know how much this installation cost to build? Thanks!